About VegOilCar - who or what are they? Who are VegOilCar? What are they? What do they do? So who or what are VegOilCar? Well, it's a who not what, and it's me, Geoff, the guy who owns the black Toyota Landcruiser you can see above. These days I'm also known as VegOilGuy by a few thousand people on YouTube. VegOilCar is not a company - it doesn't sell anything or buy anything (so sod off you marketing annoying companies that keep bugging me). 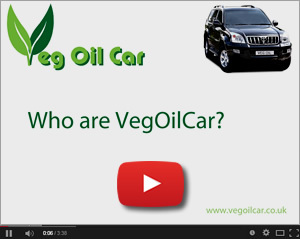 VegOilCar does not convert vehicles to run on vegetable oil, it does not sell the equipment. VegOilCar does not operate any kind of chargeable service. VegOilCar will offer free help and advice to anyone who's interested wherever it can. I created VegOilCar about 12 months after I first started running my car on Vegetable oil. I care about the environment and wanted to do my bit, but as I haven't the means to plant a few million trees, etc, I thought I'd try to make life easier for others who may want to do the same as me. By doing this, I hope, I'm making a contribution... helping lower pollutants, lower emissions, decreasing the use of fossil fuels, increasing the use of bio fuels, etc. I know it's a lofty statement, but if just one other person follows my route, then it's a good start. As such the information provided on this page is done so freely. If you have any questions and need a little guidance, I will happily do what I can to help - but as I say, I'm not a company, I don't charge, I'm certainly no expert, so please take my advice the same as you would off any other caring acquaintance and - before you make any life changing decisions - do your own research. If you hear of GOOD companies do work in this field, let me know and I'll list their details freely on my site for their own good and yours. Similarly if you hear anything BAD about such companies, let me know and I'll react accordingly. So, to sum up - not a company, sell-nothing, not mechanics, do care about environment, do care about veg oil motoring, am happy to help. Donate a couple of pounds... purely optional of course. Neither of the above is compulsory, but either or both certainly do help.